It is said that there are a thousand Baptist preachers in Texas, regularly ordained, who are neither pastors of churches, nor missionaries, nor teachers in schools - men without any charge. Was God mistaken in calling these men to preach, or were the churches mistaken in putting them into the ministry with undue haste? Doesn't such a lamentable fact as this vaste horde of unemployed men call upon us not only to exercise more caution in the matter of ordination, but to offer devout, earnest, and long continued prayer to God that we may make no mistake? 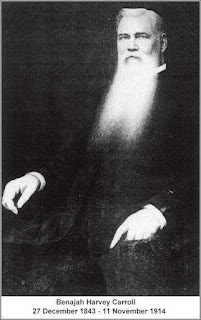 Is it possible that some of these men failed to find employment because not apt to teach others, or because, though apt, they would not study to show themselves approved unto God; others because, having put their hands to the plow, they look backward, and others because they are not willing to endure harndess as good soldiers of Jesus Christ? And if there be any of these possibilites, does it not indicate that sin lieth at the door of the churches, which without due consideration, and especially without importunate prayer, laid hands on men who were not called of God, nor sent? Ah, me! What a question is this ministerial question! Brothers, if ever you find yourself out of objects of prayer known to be lawful, concentrate your devotion on this point: Pray for preachers! Pray for wiser churches! There are a host of additonal reasons why their are ministers struggling with placement. Carroll touched on some possibilites that can be laid on the minister. Some blame can be laid on churches who fail to look beyond superficial hindrances when considering a candidate. Whatever the reason, a minister without a place of ministry is a "lamentable fact." I get to pastor college and seminary students. It is a joyful and and at times heartbreaking charge. The issue of ministry placement is heavy on me. I've decided to join old Dr. Carroll in praying for preachers and wiser churches. Please help me out with this one.